With a win in Sweden, Ott Tanak leads the WRC battle for the first time in his career; Sebastien Ogier only secures two points in the Power Stage. The season’s only pure-winter round, Rally Sweden, brought its own set of challenges for the WRC challengers. However, in contrast to the season opener’s nail-biting competition, the second round remained a one-sided affair with Ott Tanak (Toyota Gazoo Racing WRT) claiming a comfortable victory in the short final leg of Rally Sweden, with a margin of 53.7 seconds. Tanak seemed to be in the groove, as he led the four-day event from an early stage. However, he did suffer a minor setback on Day 2, owing to unfavourable conditions, because of which he slipped back. But luck was on his side as his closest rival Teemu Suninen (M-Sport Ford WRT) spun out on Day 3, giving Tanak a comfortable 30-second lead. Behind Tanak, there was a massive four-way battle for the remaining podium places. Running in second, Esapekka Lappi’s (Citroen Total WRT) 4.4 second lead over Thierry Neuville (Hyundai Shell Mobis WRT) while going into the final Wolf Power Stage seemed surmountable. However, a determined drive by Lappi fetched him the second spot, with a lead of 3 seconds over third-placed Neuville. 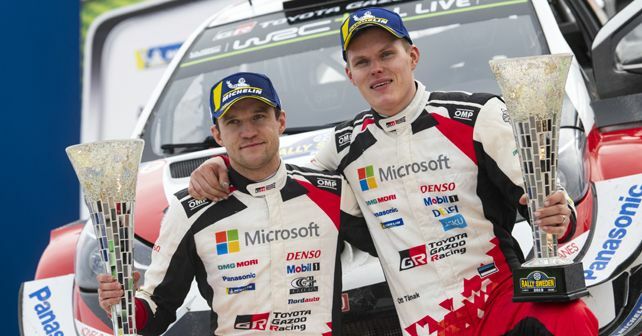 Both Lappi and Neuville fought through several spins over the weekend to achieve their respective positions. Behind Neuville by 8.7 seconds, teammate Andreas Mikkelsen secured a fourth-place finish. Claiming his seventh WRC career victory, Tanak became only the fourth non-Scandinavian driver to win the championship’s only pure-winter round. He also leads the World Rally Championship for the first time in his career with 47 points – 7 points clear of second-placed Neuville. Sebastien Ogier currently sits in third with a total of 31 points. As Loeb joins Hyundai for 2019 WRC, what further changes to expect? WRC 2017: Is there finally a rivalry in an otherwise unpredictable season?